Tioga Pass is the only entrance on the eastern side of Yosemite National Park. At 9,941 feet high, it is the highest point on the mountain drive and one of the most scenic in the park. Views of the surrounding forests and mountains are worth the drive alone, but if you’re after one of the park’s many hiking trails the trailheads for Gaylor Peak, Tioga Peak, and the Twenty Lake Loop are all nearby. For a less active experience, Tioga Lake offers picnic facilities and trout fishing close by. Driving to and through the Tioga Pass is an adventure: full of tight curves and steep drop-offs. But you’ll be rewarded with some of the most beautiful views in Yosemite Valley, and once you reach the pass you’ll be in the park itself. The road through the Sierra Nevada mountain range is the highest highway pass in California. 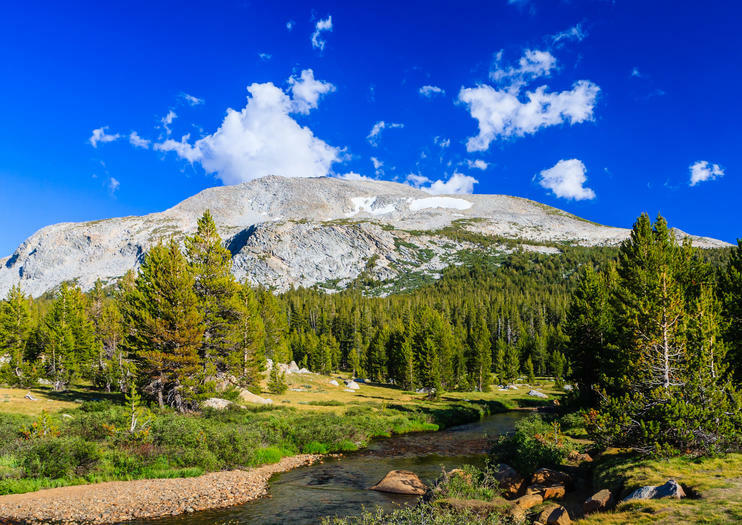 You can find Tioga Pass six miles east of Tuolumne Meadows on Highway 120. Pending weather conditions, Tioga Pass does close during some parts of the year (typically November to March.) Be sure you have enough gas in your car before driving to the pass, as there is limited supply around the park. Experience the grandeur of Yosemite National Park and the Sierra Nevada mountain range including Tahoe and Mammoth Lakes. This 4-day excursion, departing from San Francisco, takes you into the rugged Ansel Adams Wilderness and introduces other landmarks including Yosemite’s giant sequoias, Devil’s Postpile National Monument and the ghost town of Bodie State Historic Park. You’ll discover an outdoor playground filled with pristine lakes and sweeping vistas, with the option to kayak, stand-up paddleboard or bike around Lake Tahoe. Overnight hotel or camping accommodation is included on this small-group tour by minibus. Explore the scenic highlights of Yosemite National Park on a full-day, small-group guided trip from Lake Tahoe with a lunchtime picnic beside Cascade Falls. Capture unforgettable images of the park’s soaring rock walls and craggy peaks then enjoy an invigorating hike to Yosemite Falls or Bridalveil Falls, where high-mountain rivers tumble from sheer granite cliffs. Spot rock climbers scaling the face of El Capitan, watch for deer in alpine meadows, and take in the timeless beauty of California’s High Sierra mountains.